The Miss Africa USA Pageant is grooming a new generation of African women leaders to impact their communities in Africa, America and the rest of the world. The Pageant enables African girls in America to shine the spotlight on Africa, tell their stories to the world, inspire one another, build self esteem, and feel beautiful inside and out. This pageant is like no other, the delegates are very intelligent young women from some of the most respected educational institutions in North America, with careers spanning from the Sciences to the Arts, some in Medical School or Pharmacy School, others are upcoming Journalists or Human Rights Activists and more. These young and ambitious African women have acquired the American spirit of giving back and service to humanity. Miss Africa USA delegates speak for Millions of women, children and communities who have no voice. These young women are seizing the opportunity that America presents to advocate for the less fortunate. No one would have believed 6yrs ago that a Miss Africa Queen would one day ship a container of Medical Equipment and supplies worth up to $450,000 from America to Africa, supporting 6 different local hospitals. 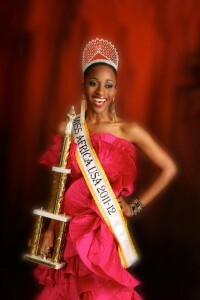 Well this is what Miss Mfonobong Essiet, Miss Africa USA 2007-2008 did. She rallied communities in Miami Florida and raised funds for her project and she delivered. Her donation of medical equipment and supplies to hospitals in Nigeria was received with great joy and celebration in those communities. No one would have believed 6yrs ago that an African Queen in America would join forces with major charity organizations in the USA such as Concern USA, Habitat for Humanity, Diamond Empowerment Fund, to help raise funds for charitable causes benefiting communities in Africa and the United States of America. That is exactly what Miss Nyasha Zimucha, Miss Africa USA 2008 – 2009 did, she volunteered with Habitat for Humanity to build 25 homes for the homeless, she joined Concern USA and Concern World Wide campaigns and helped raise over $120,000 for chairity, She volenteered for Russell Simmon’s Foundation The Diamond Empowerment Fund, performing and speaking at fund raising events and mentoring children in the Arts. DEF supports schools in South Africa. Nyasha also started a campaign to stop Xenophobia attacks in her homeland South Africa, in 2009. Miss Teizue Gayflor, Miss Africa USA 206-2007 toured Liberia in 2007 on a mission to promote education among school children. At the time, Liberia was pulling out of a civil war that had destroyed the country. She toured various schools and installed ceiling fans in congested classrooms to make the learning environment more comfortable for children, she volunteered at orphanages helping children who had lost their parents in the bitter war that tore Liberia apart. She had a message for Liberians which she broadcast over radio and television interviews calling for peace and reconciliation. The Pageant has certainly attracted highly motivated young women with extra ordinary stories and a renewed energy to advocate for women and children in need. It is therefore no surprise that a delegate who has been a victim of child slavery and child trafficking who finds herself in a top College in America, volunteering with the United Nations, decides today to step up and speak up against this crime on humanity. It is not surprising to have a delegate who became orphaned due to the genocide that took place in Rwanda, got adopted by a wonderful American family and brought to the United States, now living a comfortable life and enrolled in a University decides to step up and advocate for the orphans the orphans in her native Rwanda who do not have the opportunities that she had. It is amazing to hear first hand from an orphan from Namibia who lost both parents to HIV/AIDS, though she tested negative, she now has the responsibility to care for her younger siblings who were not so lucky as she was. No wonder she is working at helping orphans who lost their parents to HIV AIDS. The Stories are many and that is what places the Miss Africa USA Pageant apart from all other pageants.